This is a high-potency formulation, supplying chromium in amounts found more effective in recent research for supporting glucose tolerance. Additionally, the picolinate form is emerging as the preferred form used in clinical trials. One capsule daily supplies more highly bioavailable chromium than do most other chromium products on the market. 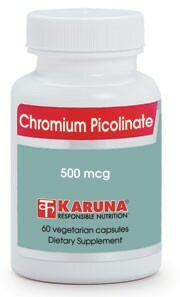 Chromium Picolinate, 500 mcg, is a high-potency formulation, supplying the preferred dosage for optimum support of normal blood sugar metabolism (Diabetes care 2006;29:1826-32; Diabetes 1997;46: 1786-91).